Ingredients: INGREDIENTS/INGREDIENTS: BUTYL ACETATE . ETHYL ACETATE . NITROCELLULOSE . ACETYL TRIBUTYL CITRATE . PHTHALIC ANHYDRIDE/TRIMELLITIC ANHYDRIDE/GLYCOLS COPOLYMER . ISOPROPYL ALCOHOL . ADIPIC ACID/FUMARIC ACID/PHTHALIC ACID /TRICYCLODECANE DIMETHANOL COPOLYMER . STEARALKONIUM HECTORITE. DIBUTYL ADIPATE . TRIMETHYL PENTANYL DIISOBUTYRATE . CITRIC ACID .CARTHAMUS TINCTORIUS (SAFFLOWER) SEED OIL . COPERNICIA CERIFERA WAX . HYDROLYZED CORN/SOY/WHEAT PROTEIN THIOGLYCOLAMIDE/THIOPROPIONAMIDE . BIOTIN . WATER/AQUA/EAU (AND) CAMELLIA OLEIFERA LEAF EXTRACT . GLYCIDOXYPROPYL TRIMETHOXYSILANE/ METHACRYLOYL PROPYLTRIMETHOXYSILANE /METHYLTRIETHOXYSILANE/MERCAPTOPROPYLTRIMETHOXYSILANE . HYDROLYZED RICE PROTEIN . NYLON-12 . OENOTHERA BIENNIS (EVENING PRIMROSE) FLOWER EXTRACT . BAMBUSAVULGARIS (BAMBOO) EXTRACT . AUCOUMEA KLAINEANA RESIN EXTRACT . (+/-) (MAY CONTAIN/PEUT CONTENIR) : RED 34 LAKE (CI 15880) . FERRIC AMMONIUM FERROCYANIDE (CI 77510) . TITANIUM DIOXIDE (CI 77891) . RED 7 LAKE (CI 15850) . IRON OXIDES (CI 77491, CI 77499) . TITANIUM DIOXIDE [NANO] (CI 77891) . YELLOW 5 LAKE (CI 19140) . 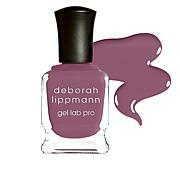 I am a huge fan of Deborah Lippmann nail lacquers. This is quick drying to touch, and needs just a little longer to actually set up hard. I am hard on my nails (cleaning and dishes, no gloves etc) and I have found these lacquers to hold up for at least a week or more. They can easily be touched up a bit if need be. I do not like the nail damage, the toxins and the harsh removal of gel nails and not to mention cost!!! 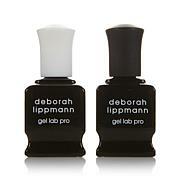 Nothing lasts like Gel Nails, but this is a great alternative. Great quality, dried quckly and hardly any issues nicking.